Christmas is My Favorite time of the Year. I just Love all of the Decorations and Family time. The Sundblum Santa is Very Special to me. I hope you enjoy the images I've collected. If you think the page is overdone "Sorry" you should see my house at Christmas. :) A Big Thank You goes to Colagrrl for the Special Wallpaper she created. This Page may load slow, but it's worth it. So Grab a Coke and Smile!! 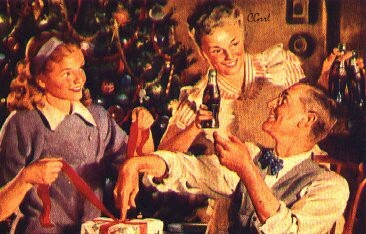 In 1931, the Coca-Cola Company Haddon Sundblom to develop the image of a human-like Santa Claus. Prior to Sundblom's first rendition in 1931, people envisioned Santa Claus as a gnome or a bishop. For inspiration in creating his Santa Claus, Sundblom turned to Clement Moore's 1822 poem "A Visit From St. Nicholas". Moore's description of the toy maker as "chubby and plump, a right jolly old elf" led to an image of Santa that was warm, friendly and human. Sundblom's original model for Santa was his friend and neighbor Lou Prentice, a retired salesman. After Prentice died in the late 1940's, Sundblom would often find his model by looking in the mirror. The remaining Santa paintings use Sundblom as his own model -- although he said he added the beard as he painted, rather than growing one. Haddon Sundblom painted 35 years of Santa portraits for the Coca-Cola Company. Another one of My Favorites is Haddon Sundblom's Sprite Boy, which was originally used to introduce the brand name Coke in 1942. The Sprite Boy wore either a soda-jerk's cap to promote fountain sales of Coke or a bottle cap to advertise bottled Coca-Cola. After 1949, the Sprite Boy would not appear with Santa again, and he disappeared altogether from advertising for Coca-Cola by 1958.